Full credit and thanks for this information goes to Scott of Sorrento, (aka Thunderdog), who took the time to write it up, take the pictures and Email them to me for posting. Scott's Disclaimer: I'm not a California resident. In 2000, I got a great deal on a cherry (California model) A14 from a Powersports dealer here in Florida. 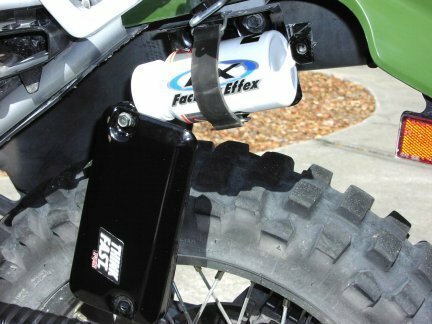 Initially, I'd no intention of removing the KLR's Evaporative Emission Control System. It doesn't weigh much, and seemed to have zero effect on performance. Zero effect until one sunny day, a valve within the system (don't know what this valve's called..we'll call it the "buzzkiller valve" for now) got clogged (after 13k miles) and stranded me at the intersection of Mayhem & Chaos during rush hour. (it just died, showing symptoms of fuel starvation) The KLR had never stranded me before, so this was the fatal mistake for Buzzkiller & his assembly. 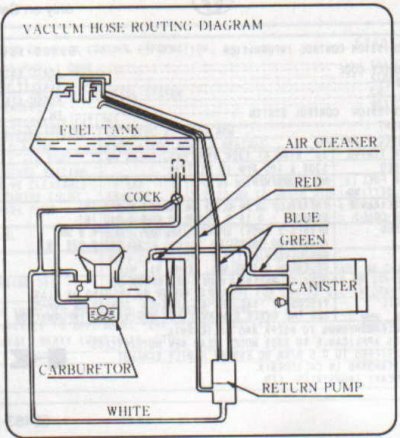 First off, there's a complete diagram of the Evaporative Emission Control System hose routing, in your owners manual. Have this handy as you read this story. 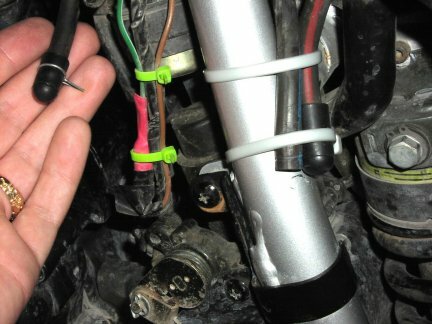 The vacuum hoses are color coded. NOTE: The diagram has been scanned and added directly beneath this text. NOTE: You'll want some rubber vacuum hose caps. I bought an assortment pack at a local auto parts store for 2 bucks. First, remove both side panels to remove the seat. Picture2 above - It's a good idea to save everything in the case that you ever sell the bike in California. Now remove the return pump from its bracket. I cut off the part of the bracket that actually held the pump, (piece seen in Picture2), in place. Then file smooth the rough edge on the remaining part of the bracket that's still attached to the frame. Picture3 above. Now you've got red, white & blue lines dangling from where the return pump used to be. 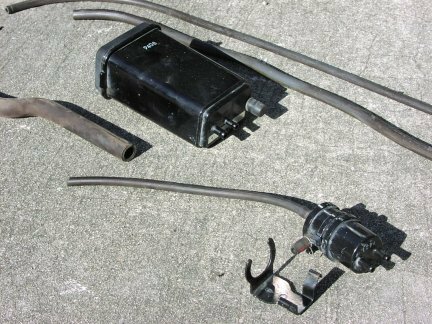 The blue line from the gas tank vents to atmosphere, I tie wrapped that one to the frame, it's likely best to run it down in front of the rear tire with the other hoses. 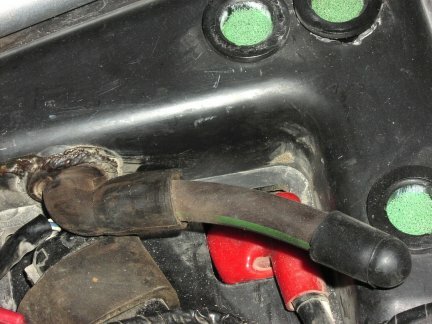 The red line from the gas tank needs to be trimmed/capped, as does the white line coming from the bottom of the return pump, as seen in Picture3 above. I read a post by "CA (emissions fell off officer) Stu" that recommended replacing this "T" that you end up with, by using (1) line so that the petcock vacuum line goes directly to the carb. This is a really good idea, it was getting really late, I just capped off the "T". That's it! And now you have an empty mounting bracket with cover, for storage purposes. Picture4 above. 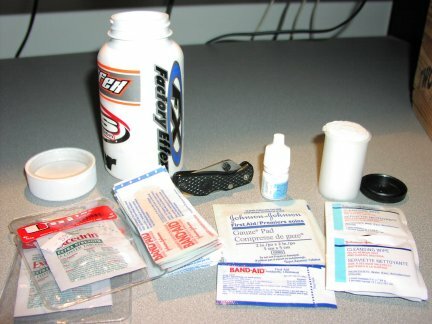 I used the existing emissions box mounting bracket / hardware / cover, to house a home made, (el cheapo grande), first aid kit. Using the existing emissions canister cover keeps things looking nice & stock. There's actually room for alot more stuff. The bottle's just half full. I plan on adding more disinfectant type stuff as I find it. For now, I stuffed some napkins in there for a tight fit. The bottle's been waterproof so far.